Quebec City is one of those places that feels so different from the rest of Canada that, if you squint, you can almost pretend you’ve taken the family to Europe when it’s really only about a ten hour drive and you don’t have to get into that whole currency exchange, passport photos, and expensive flight business. Today we’re sharing our travel and activity itineraries for families heading there on a road trip from Halifax to make your vacation planning easy! We prefer to break up this length of a drive into two days (and for long drives we always follow our Road Trip guide which you can find here). When you leave Halifax head straight to Moncton for your first stop. We always check Pickle Planet Moncton for cool playgrounds in the area. Last time we went we chose this playground which was an easy hop off the highway and met up with our friends from Pickle Planet for some kiddo playtime to burn off energy. After lunch, push on for about three hours to get to a spot just outside of Hartford which is home of the Covered Bridge Potato Chips factory which offers tours. For a fee you can watch and learn the process of how potato chips are made and then do some flavour creation and sampling. Fifteen minutes from there is the world’s longest covered bridge so make sure you zip by there to check that out. After that, get back on the road for another hour and a half to head on to Edmundston for dinner and to stay the night. The next morning there’s about a three and a half hour drive and then you’ve made it to Quebec City! Coming home we just went in reverse but stayed in Moncton and then drove home from there. We find on the way home the kids are more likely to tolerate a longer drive as they’re tired and just want to flake out in the car. There was a decent amount of parking around the base of the city but it’s worth it to check with the tourism board for some suggestions. We ended up in an outdoor lot at the bottom for Old Quebec but the trade-off was an uphill walk to get to the main part of the city. Luckily there are some cannons and fun views along the way to keep the kids moving. And piggybacks. Lots of piggybacks. Another option is to take the funicular up and down the hill. It’s a little train that feels more like a gondola that goes up and down the side of a (VERY) steep hill. There are also plenty of fun little shops scattered all through the town with cobblestone streets to walk on. The Fairmont Le Château Frontenac looks kind of like a castle so it’s worth it to pop in to explore the main floor a little bit. As it’s a walled city it’s also really fun to walk the walls and check out the incredible views. There are certain points around the city where you can access the walls so it’s good to plan ahead so you don’t wander around aimlessly looking for how to get up. Lots of stairs to the top of the wall! It’s quite a climb to the top (or maybe that was just the heat wave talking) but once there it was worth the walk. I will admit, I have mixed feelings on most aquariums and zoos as some are not the greatest at protecting animal welfare, but we did visit this huge one in Quebec City and the kids loved it. The amazing sand sculpture above was there (along with a few others) and there are lots of indoor aquariums as well as a few outdoor ones with seals and polar bears. The indoor aquariums were amazing and even had a wall of jellyfish which reminded us of the restaurant in the movie Sing! There was also a big touch tank with staff on hand who were really knowledgeable and helpful and answered all of my kids (and our!) questions. We loved that there was a natural playground to climb and explore in, as well as a traditional playground. There is also a large splash pad area which, since it was right in the middle of a massive heat wave, was extremely appreciated! 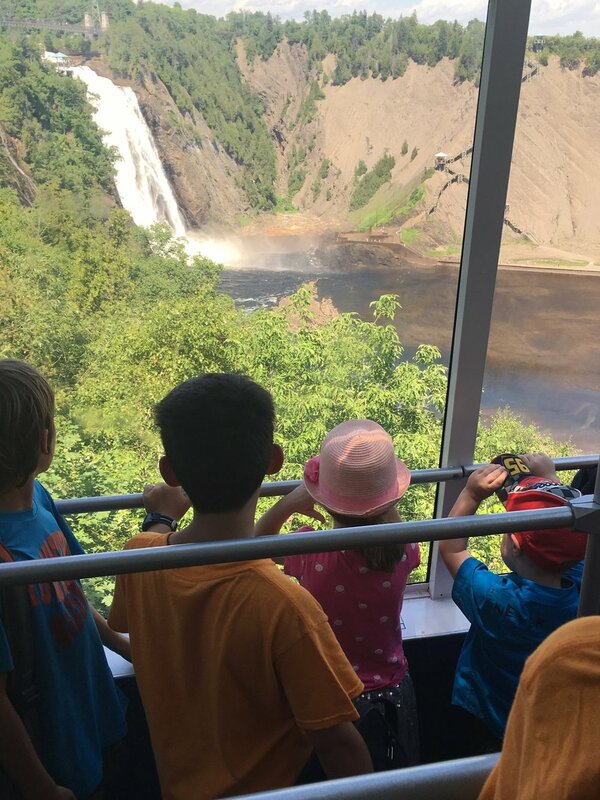 The highlight of our trip was the Parc de la Chute-Montmorency. These huge waterfalls are about fifteen minutes from the city and can be reached by climbing a large set of stairs or a gondola, or walking to the base of them on a flat sidewalk. There was also an option to zipline across them, but, yeah, that idea was rejected pretty quickly. We did the gondola first as we wanted to cross the bridge over the falls (see it in these images from the gondola??). The walk across the bridge was a little wild and super cool to see them from that vantage point. There is also a small playground and restaurant at the top of the falls. We didn’t make it to any museums on our trip but I’ve heard that the Musée de la civilisation is quite kid friendly. They have several other museums throughout the city as well. Another fun outdoor activity that we REALLY wanted to get to but didn’t have enough time was the Vallee Secrete. It’s a gnome forest about forty-five minutes outside of the city!! There are little trails with activities for the kids and it can be done in French or English. If you like mountain biking there are some great trails in Saint Raymond fifteen minutes from Vallee Secrete. Of course there are also playgrounds all over the city. Check out the Playground Buddy app to find some near where you are staying. I don’t have specific recommendations in Quebec City but there are several family focused hotels in the area. We ended up choosing an Airbnb (affiliate user link) fifteen minutes from old Quebec which worked out perfectly for our family. I’ll be writing a post soon about why we love using the Airbnb network for our family travel. 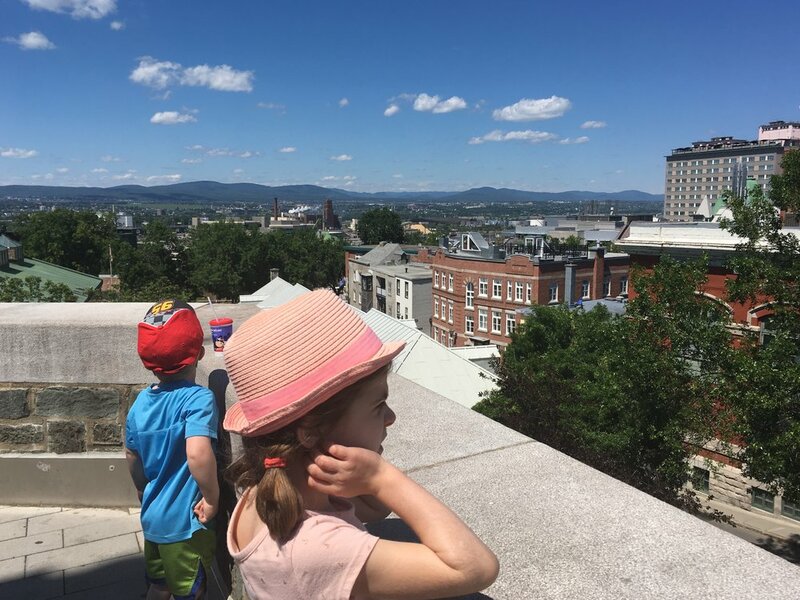 Have you been to Quebec City with your family? Did I miss any great attractions that you’d like to recommend? Please add them in the comments for other readers!